This is a striking bag, with strong, colors, wording and a straight forward design. We especially like the color coding at the grip tear parts at the top and bottom, but the graphic is weak and the overall effect seems a little dated - almost as if it were designed during the early period of desk top publishing. The Snap Test found a firm crack of a whole Potato Chip as it split in half. We put two together and it felt like eating something more substantial like a cracker. There wasn't the brittle snap of a regular Chip, but instead a firm, beefy crunch. A golden yellow (with darker seasoning sprinkled around) and fairly thick Chip without many little bubbles created by hot oil. Although they were somewhat greasy to the touch they probably had not been fried for as long as many regular Chips. There was some seasoning powder visible plus some flecks of Chip on fingers. While it would be nice to say these were burning hot, as anything with the word 'Devil' would suggest, it would be fairer to say that a rather thick, peppery, even slightly smoky flavor was hot enough and got hotter the more you ate. 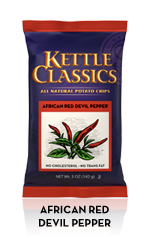 Most of Kettle Classics hot Chips are not really hot at all; these were that bit hotter and get our vote.